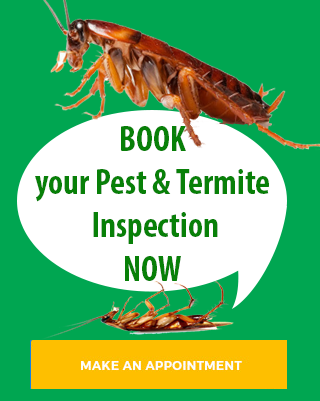 Evergreen Pest Control can eradicate all cockroach problems efficiently using the latest environmentally friendly pest control processes. We service all areas from the Gold Coast to Northern NSW including Burleigh Heads, Palm Beach, Elanora, Currumbin, Tullebudgera, Tugun, Bilinga, Kirra, Coolangatta, Tweed Heads, Banora Point, Terranora, Bilambil, Chinderah, Fingal Heads, Kingscliff, Cudgen, Salt, Pepper, Reef, Casuarina Beach, Duranbah, Tumbulgum, Condong, Eviron, Murwillumbah, Mooball, Burringbar, Uki, Bray Park, Clothiers Creek, Cabarita Beach / Bogangar, Hasting Point, Pottsville Beach, North & South Golden Beach, New Brighton, Ocean Shores, Brunswick Heads, Billinudgel, Mullumbimby, Byron Bay, Suffolk Park, Bangalow. Red imported fire ants are a serious new pest, which have been detected in Queensland, Australia. They inflict a painful sting and if not eradicated will seriously affect our lifestyle. They are the greatest ecological threat to Australia, since the introduction of the rabbit, and are potentially worse than the cane toad. Why are fire ants a problem? They have the potential to destroy our outdoor lifestyle, environment and agricultural production. Fire ants are a social menace because of their sting. Encounters with fire ants may involve hundreds of ants that may move quickly and remain undetected as they crawl up your leg, by the time they sting, there may be tens or hundreds of ants on your body, and they tend to all sting at once. Fire ants have a sting in their tail, similar to wasp and bees, however unlike bees, fire ants can sting repeatedly. Stings from fire ants can cause a painful, burning and itching sensation, which can last for an hour, the sensation produced by multiple stings is that the body is on fire, hence, the name fire ant. After a few hours (or even a day or two), a small blister or pustule can form at the site of each sting, these may become very itchy and can take up to 10 days to heal. Note: Only in extremely rare cases will fire ant stings be lethal to humans. The impact of fire ant is not restricted to people, pets and domestic animals can also be stung and injured, and may have allergic reactions. Preliminary climate model analysis by the CSIRO has shown that fire ants have the potential to inhabit most of the major coastal areas of Australia, and extensive areas of the tropical north. Vast areas of the continent’s natural environment, including world heritage areas and national parks, are prone to fire ant invasion. Fire ants are very aggressive and a voracious feeder on small ground fauna, including insects, spiders, lizards, frogs, birds and mammals. Consequently, fire ants may displace or eliminate some of Australia’s unique native ground fauna. This already appears to be occurring in some fire ant infested bushland areas in Brisbane’s southwest. For information on fire ants, please contact the Queensland Government, Department of Primary Industries DPI Call Centre Ph: 13 25 23. The black house ant is shiny black and two to three mm long. Nests are normally in the ground, under bark or in decaying timber. Trails, which are well defined, may extend over long distances and go up into shrubs and trees, where the ants feed on honeydew from sap-sucking insects. They can nest in roof or wall spaces. The group includes species which track across ceilings, beams and joists and drop ant debris onto surfaces below. Preference is for sweet foods but will eat seeds, plants, fats and grease. Their need for moisture is the most common reason for invading kitchens, bathrooms or other sources of water in a premises. Adults cannot ingest solid food particles but ingest liquids which are pressed out of food material. Larvae depend entirely on workers for food. Young larvae are fed in liquids, the older larvae are fed on small food particles which they can ingest. Adults will also feed on excretions from larvae. Trailing of ants can also be considered unsightly. Swarming can occur within a premises which can cause distress to the occupants. Invasion of kitchen areas and wet areas can also be a nuisance to occupants. Can be vectors of disease organisms such as dysentery, smallpox and bacteria such as Salmonella. The adult stage is considered the pest. These ants are two to three mm long. The soldiers have very large heads. Coastal brown ants often nest between pavers and along pathways and will throw out soil. They also infest wall cavities, leaving piles of debris at the nest entrance. Nests can become very large. Proteins and fats are preferred to sweet foods. Originally from Africa, the Coastal Brown Ant, is prominent in domestic situations in the Perth/Fremantle area; Darwin; and east coast towns, south at least to Sydney. It is considered the major ant pest in many areas. 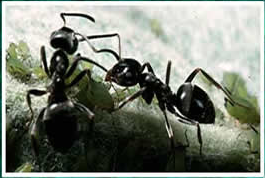 Distinctive large-headed major workers are present along with ordinary workers. The majors defend the colony, and perform special tasks, such as seed-cracking. The waist is 2-jointed, and a sting is present. This ant infests houses, stores and gardens, taking food ranging from sugar to cheese, meat and bread. Outside it tends sap-sucking bugs and interferes with gardening, cultivation and harvesting. Tropical crop trees like coffee can fall over because of soil loosening by Coastal Brown Ant nests. The natural food of the ants consists of honeydew from aphids, other insects, and plant juices, but they will readily forage for water and food scraps within the house. Habitat: Under natural conditions, Carpenter ants nest in live or dead trees, rotting logs and stumps. However, they will also construct their nests in houses, telephone poles, and other man-made wooden structures. Nests start in deteriorating wood which has been exposed to moisture. Often, the colony will extend its nest to adjacent, sound wood. Nests are commonly found in porch pillars and roofs, window sills, and wood in contact with soil. Type of Damage: Carpenter ants rarely cause structural damage to buildings, although they can cause significant damage over a period of years because nests are so long lived. 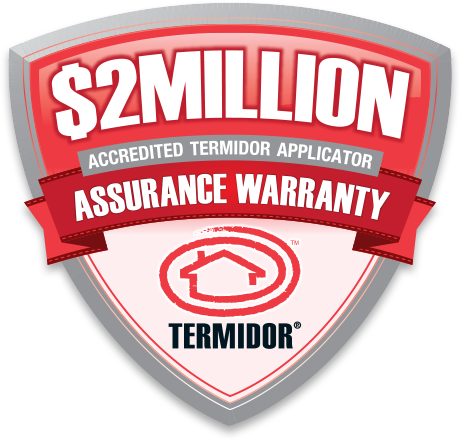 Some recent evidence indicates that they can also cause extensive damage to foam insulation. Interesting facts: Ants of the genus Camponotus are known as carpenter ants because they house their colonies in galleries they excavate in wood. Carpenter ants do not eat the wood they remove during their nest-building activities, but deposit it outside entrances to the colony in small piles, the wood is used solely as a nesting site. The galleries of carpenter ants are kept smooth and clean, and are not lined with moist soil as termite galleries are. There are about 90 species of bull ants in Australia with diverse behaviours and life cycles. Some of the smaller species are known as jumper ants after their habit of aggressively jumping toward intruders. Several species have no colony workers. Instead, a raiding queen invades the nest of another species, kills the resident queen and takes over the colony. Bull ants have a fearsome reputation, and deservedly so. They are large with long, straight, powerful jaws and a potent venom-loaded sting. They attack intruders of any size that come too close to their nest. Bull ants also have well-developed vision and will follow or even chase an intruder a good distance from the nest. Usually the sight of large aggressive ants streaming out of the nest is enough to prompt a hasty retreat. If not, the ants deliver painful stings by gripping the intruder with their mandibles (jaws), curling their abdomen to reveal the sting and injecting the victim with venom. Often multiple stings are delivered. 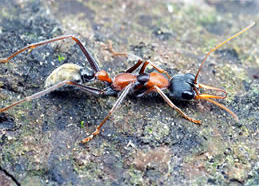 Many species of bull ants have bright red or orange colours on the head or abdomen. They collect nectar and other plant juices, as well as animal prey, which are carried back to the nest. Nests are usually underground and often have hidden or small entrances. The nests can extend several metres below the ground. Ants cause problems primarily when they forage in buildings for food or water and when they construct nests in buildings and gardens. When searching for food, they can be attracted to a wide range of products with different species preferring sweets, meats, fats or oils. They will also search indoors for water during dry periods. When desirable items are found many species will recruit fellow nest mates to help gather the food and return it to the nest. This can result in large numbers of ants appearing over a short period of time. Some ants build nests in walls and foundations, or indoors in potted plants, enclosed areas, and even in cavities in toilets and sinks. In almost all cases nests are limited to pre-existing cavities or spaces between objects or in rotten wood and seldom will ants attack solid structures. Thus they generally will not cause structural damage to buildings but will take advantage of existing deterioration. Outdoors, nesting activity can result in excavated soil being deposited in gardens and on brickwork. Ants often move nest sites when disturbed, or with a change in food supply. This can make control and remove of ants difficult. They may leave for short periods only to return later when a new food source is located and they can recolonise from nearby nests very quickly. formulations such as dusts, liquids and granular products have all been used to treat various situations in the battle against these ants. Unfortunately, very few treatments ever find their true target and eliminate the queen, but instead rely on killing by contact. This however can have limited success as ants are extremely adaptable and quite often display learned behavior. Ants finding ways around chemical or physical treatments often display this. More often than not, only a percentage of the colony is killed and the queen and her other workers continue to rebuild their numbers. In the latest fight against these ants, baiting products and techniques used by Evergreen Pest Management are proving very effective with in some cases treatments of foraging ants resulting in nest elimination over a period of several weeks. In larger infestations a number of treatments may be required. It is essential that the bait is highly attractive, palatable and also extremely slow acting. This allows for plenty of bait to be consumed and lethal doses to be passed throughout the entire colony without the ants ever suspecting a thing. Food preparation and eating areas should be kept free of food particles and waste, and susceptible foods stored in airtight containers or in the refrigerator. Where pets are fed regularly in one place, leftovers should be cleaned up immediately. Decaying timber, which would provide nesting sites, should be removed. Pouring boiling water into soil nests does not work, nests are often deep down and even if the water reaches the nest the water will have cooled.